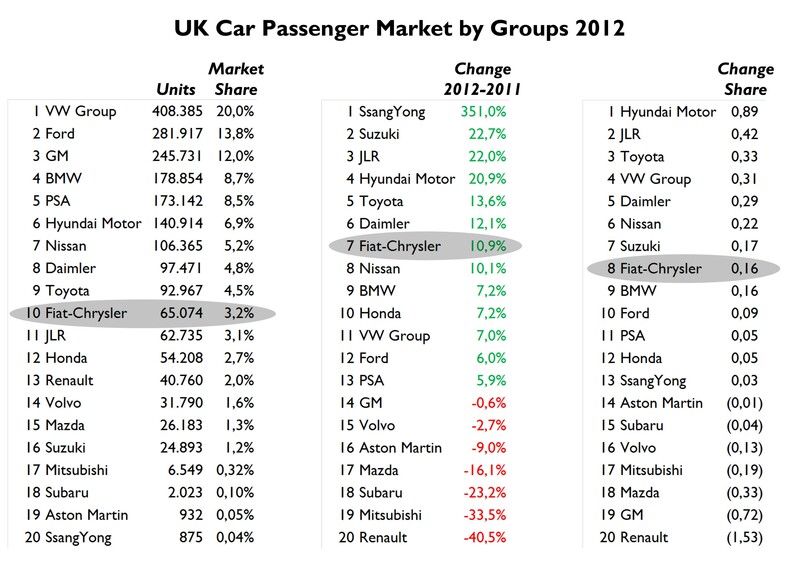 British car market was the only big European one to have a positive growth in 2012. Its good performance allowed it to become the second largest car market in Europe, after Germany and ahead of France and Italy. The UK is not having the same problems of its European partners, and the car market proves it. Of course the situation is not the best either, as car registrations are still far from 2007 level. But with so many bad news coming from Southern Europe, it is always good to hear that the troubled car makers had a slight relief in one European country. Fiat-Chrysler made part of the growth and 2012 was a good year for most of its brands and models. The UK passenger car market, was along German one, the only one to surpass the 2 million unit mark. The market is up a not bad 5.4% or 105.000 more units. It is not an impressive change, but is very good considering current European situation. It helped somehow French car makers and Fiat to reduce their fall in Europe, but did not help them in terms of production, as the cars that they didn’t sell in Europe were not adapted for British market. 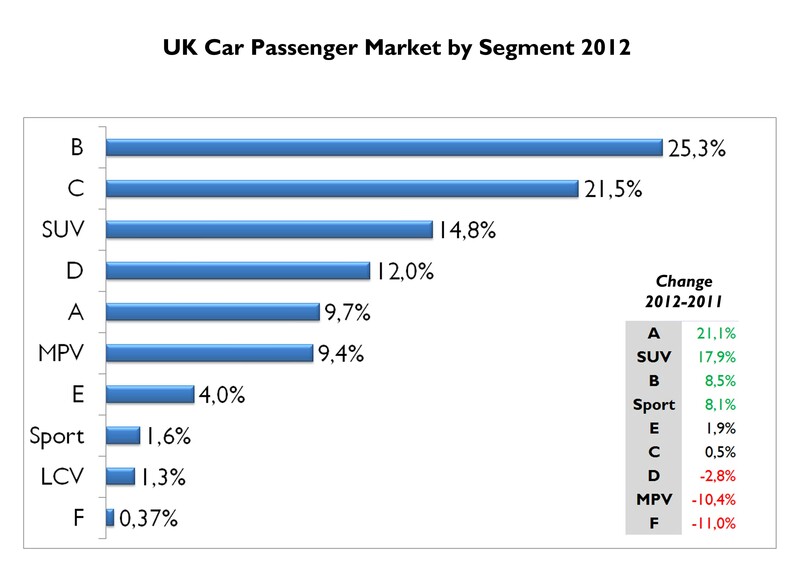 Actually, British car market differs from all European markets (as it happens with many other things in Britain). They love sporty cars, from small ones up to the most expensive ones. Second, it is a wider market in terms of offer, as there are other car brands that are not present in Europe. Because of this peculiarities, all car makers develop their UK version for each model they sell there. And that’s why they normally take more time to be introduced. The market is clearly dominated by VW Group and 2 local producers: Ford and GM. But contrary to what anyone could think, the other local producers are far away in the ranking: Nissan, Toyota, Jaguar-Land Rover and Honda don’t sell as much as BMW, PSA or Hyundai. Last year 51.6% of total sales corresponded to groups that produce in the UK. In terms of growth, Hyundai Motor impresses, up a massive 21% and gets close to PSA. VW Group did also a good job, up 7%, and owns 20% of the market. Generally speaking all big groups benefited from the expansion of the market. Only GM and Renault reduced their market share because of specific problems with their range of products. The case of Renault is really dramatic: it lost 1.53 basis points of share and its sales are down a shocking 41% (28.000 cars). It is the result of cutting back UK range in February 2012. Due to profit reasons Renault decided to stop selling the Kangoo, Wind, Modus, Laguna and Espace as they were no longer profitable for the company. In fact the company said that it would expect a big decline on its registrations in 2012. 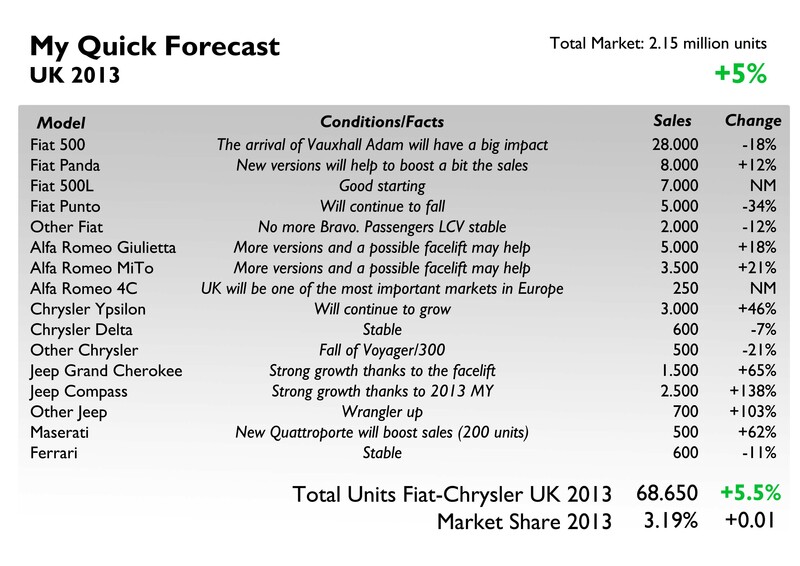 However they forecast 2013 at 2011 levels thanks to the introduction of the new Clio and Dacia range. 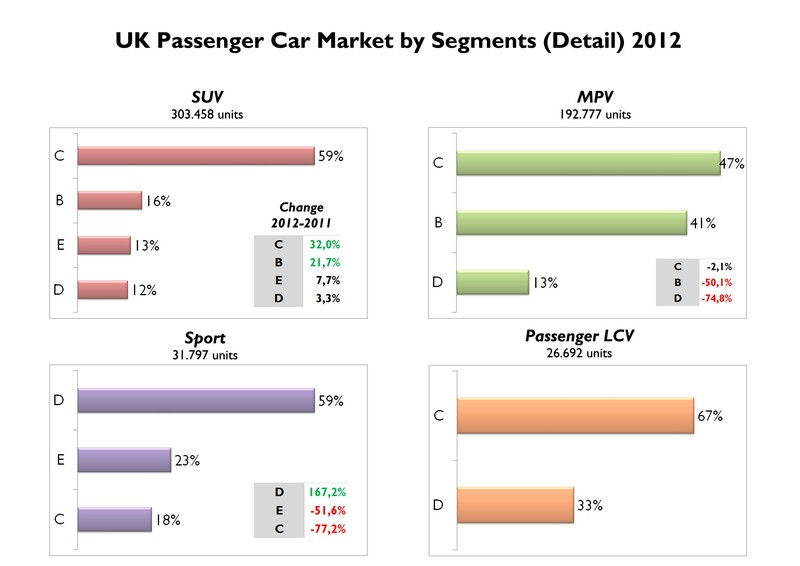 In terms of segmentation, British market has its own label: Sporty cars count for 1.6% of the market, which could be the largest share in Europe (along with Switzerland). This segment is 4 times bigger than F-Segment. B-Segment rules with 25%, and is followed by C-Segment with 22% share. The big event last year was the big jump of city cars, up 21%. 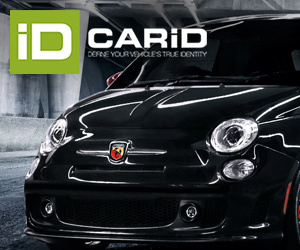 The enlarged offer has convinced more and more consumers to have one, and of course Fiat was there to lead this growing segment. In the opposite side MPV lost share, specially because of large and small ones. It is down in the ranking but had a good year. 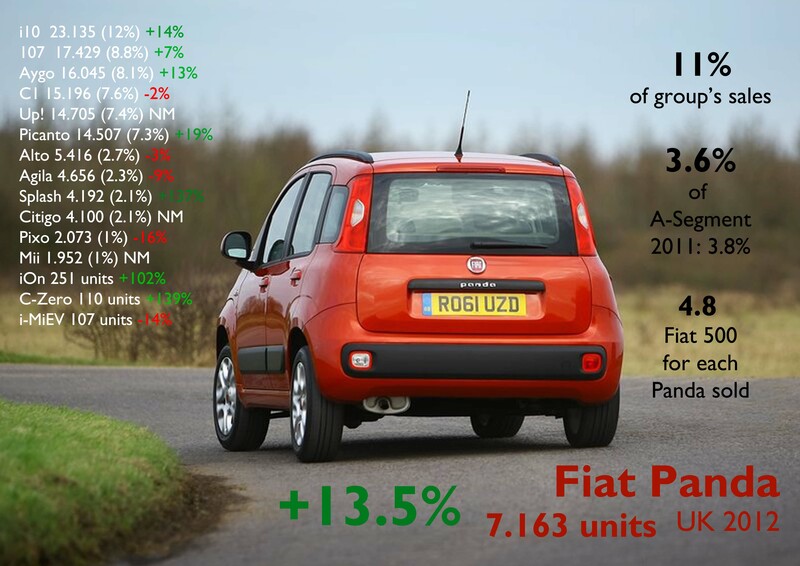 Fiat is not among the big car makers in the UK. Last year it occupied place # 10 after the locals, VW, PSA, BMW, Hyundai and Toyota. The only big car maker behind is Renault. The group is not well-recognized in the UK as it had some quality problems in the past. Nevertheless, in recent years its brands are coming back to scene thanks to successful products and a better approach. 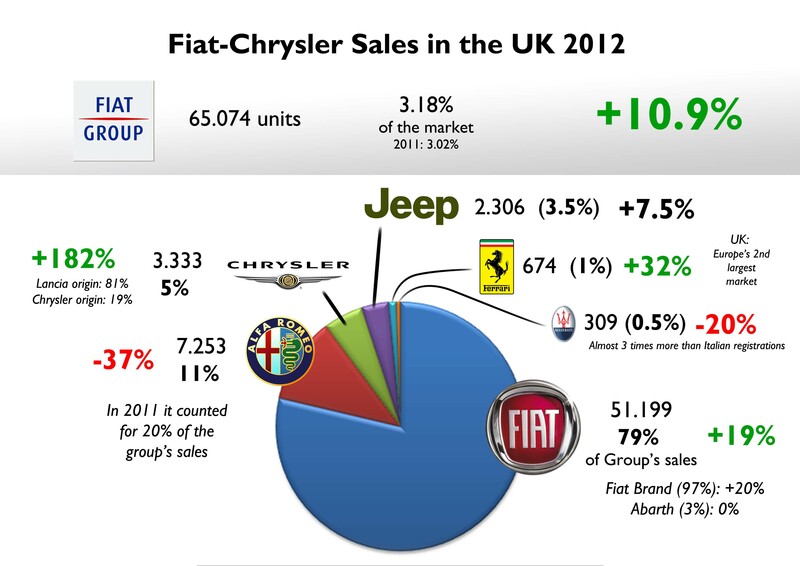 The Fiat 500 explains very well this good momentum of Fiat-Chrysler in Britain. Thanks to its excellent performance the group decided to introduce Lancia range using Chrysler name (Chrysler brand has better awareness and image among British). Last year all brands of the group sold 65.000 passenger cars, up 11%. The positive growth contrasts with the terrible fall in Italy and France where the group has higher market shares. It means the group advanced twice the market’s result. Despite the good result, Fiat-Chrysler was not the best performer among the big car groups. It was surpassed by Hyundai, Toyota, and Daimler. The group caught 3.18% of the market, which is less than the share in France and Spain, but is more than the one in Germany. 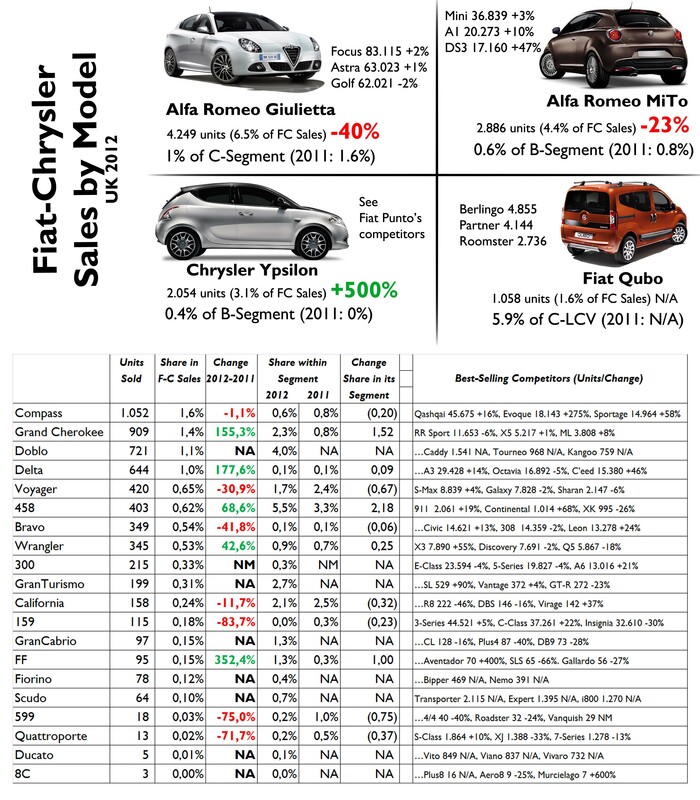 Fiat brand counted for 79% of group’s total sales, while Alfa Romeo captured 11%. Thanks to new Lancia products, Chrysler brand increased its share 3.12 bp and now counts for 5% of the group’s sales. Ferrari impresses too: 674 units were sold, counting for 1%. Finally Jeep did not do a good job and now is behind Chrysler. In terms of segmentation, the group’s sales are strongly and dangerously concentrated: the Fiat 500 counts for 53% of total sales! yes, this model is very popular in the UK but shouldn’t be the only successful model of the group. Besides, it is getting old and competition gets more and more difficult, so Fiat should not rely on its success to maintain its position in this market. 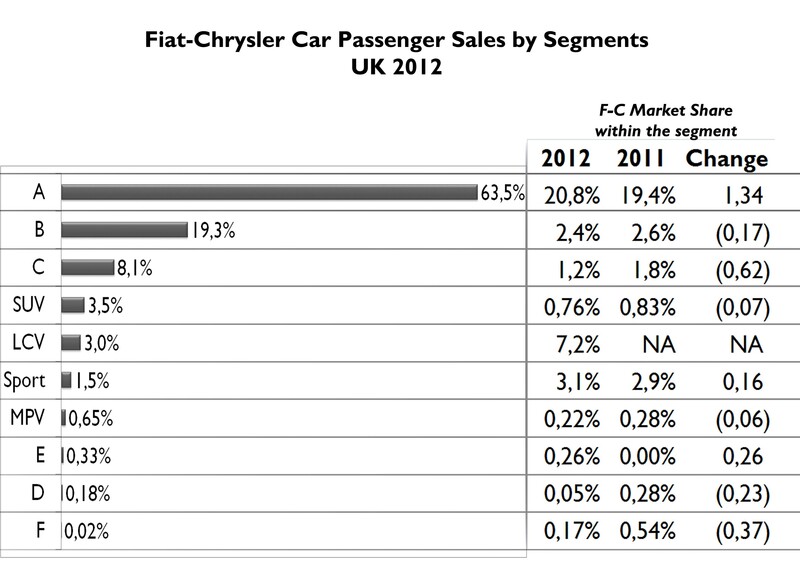 If we add the Panda’s result, then Fiat-Chrysler sales in the UK are dominated by A-Segment: 64%. That is 20 bp more than in France, and 25 bp ahead of Germany and Italy. Behind the A-Segment, there is B-Segment counting for 19% of total sales. So A+B segments count for 83% leaving only 17% or 11.000 units to remaining segments. It means that the only strong position within segments is in ‘A’ one, where the group controls 21%. 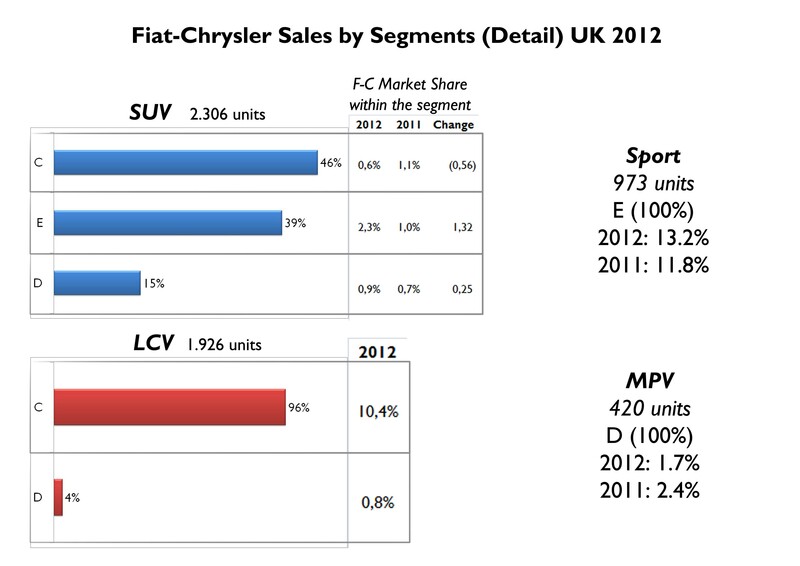 In the other segments, even in Sporty one, Fiat-Chrysler has a weak position. 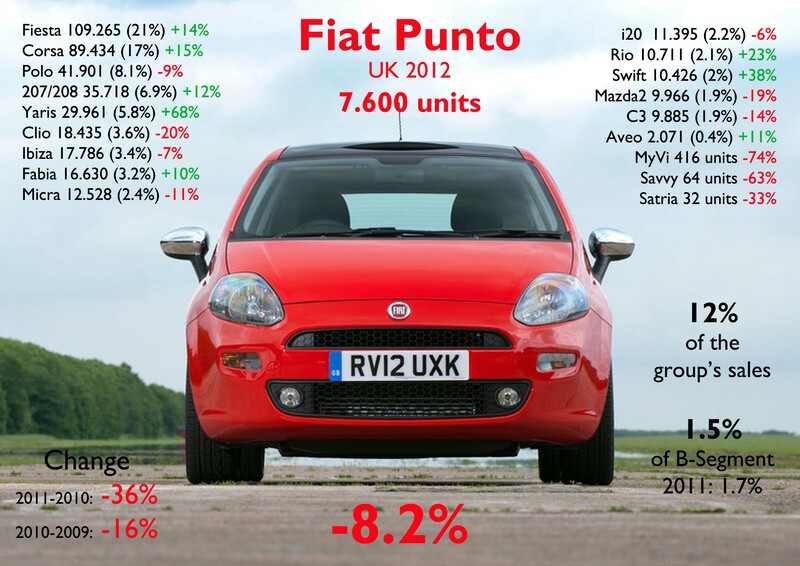 UK is the third best-selling market for the Fiat 500. It is absolutely a success since its introduction in 2008. Last year it had a record year of 34.000 units, up a massive 33%. It is only 9.000 units behind USA and Italy and doubles German registrations. The citycars boom has been correctly exploited by the small Fiat. It is not the case of the Panda, which has not had the success it should had had. It is up 13% but is very far in the A-Segment ranking, with only 7 thousand units. Actually it is just units behind the Punto, which didn’t do as bad as it did in Europe: it is down 8%, and is still quite ahead of its cousins, the MiTo and Ypsilon, which debuted with 2 thousand units, not bad for this new ‘Chrysler’. In fact, the UK became its third largest market, ahead of Germany. The same happens to the Chrysler Delta, with 644 units sold, ahead of Germany too. The Giulietta had a good start but last year it was down 40%: the lack of more body types and sporty versions begins to affect its performance. The remaining models had marginal sales. Fiat does not sell the Freemont in the UK, and the 500L just arrived in February 2013, so its presence in MPV segment is really small. 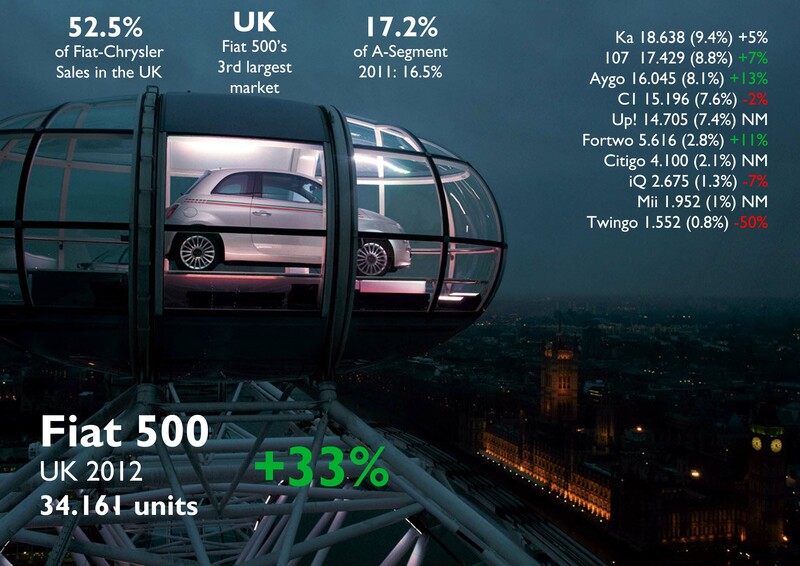 British car sales should stabilize in 2013. It means that may have a small growth but in lower terms. 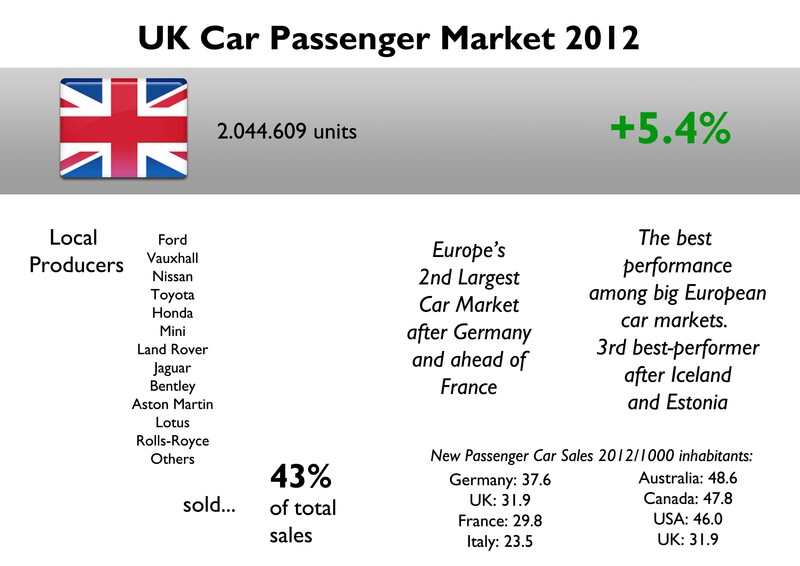 Based on the results of last months of 2012, UK car sales should be around 2.15-2.2 million units this year. The good momentum should continue as there are no big reasons to believe that economic situation will get bad in the UK. Fiat-Chrysler is expected to grow but it will lose some market share as the 500 will slow down, while the 500L will do a good job. Alfa Romeo should have a little relief thanks to the new 4C, which will work as an attraction for potential Giulietta/MiTo buyers. Chrysler will continue to grow, while Ferrari will also gain more units sold, and Maserati will strongly benefit from the arrival of the new Quattroporte. Once again, as the 2013 range of products will not have a big evolution, sales will be determined by Marketing campaigns. It is my belief that the 500L will have a good demand in the UK no matter its price. The 500 will suffer because of the arrival of Vauxhall Adam, but the Panda, Ypsilon, Giulietta and MiTo will grow a bit thanks to more aggressive campaigns and possible facelifts. Jeep will do very good with the Grand Cherokee and Compass as it will wait for the new Cherokee in 2014. The new 4C and Quattroporte will also find some buyers in the UK. ← Fiat 500L or Ford B-Max?